Each time I check my Twitter feed, it seems like there’s some reminder in there about why it’s challenging for women in tech fields. Several of these challenges stem from ingrained cultural dynamics that would require a sea change to make an impact — tasks that seem exceedingly difficult to alter all at once. Yet, patterns of gendered participation in tech fields can shift drastically and early if we change one simple thing: the tools we use to design with. And, best of all, changing our tools might even lead to better learning outcomes for the people who use them. This was actually core to the premise of the design for the SparkFun LilyPad Arduino tools envisioned more than a decade ago by Leah Buechley and others. Investigating e-textiles designed with the LilyPad Arduino has been the subject of much of my recent research, which leads me to be increasingly hopeful that the days of severely lopsided gender participation in STEM may be numbered. The relationship between tools and the ways in which they shape our understandings is central to many examinations of disciplinary learning. This is the idea behind esteemed MIT Media Lab Professor Seymour Papert’s concept of objects-to-think-with, which refers to the impact that working with a tool has on our understanding, whether it’s robotics, computing or engineering. What we may not be as aware of is the way that our tools can carry cultural baggage along with them. This is true for the traditional types of robotics tools that we use in engineering and computing and also present an opportunity as we design new tools like the LilyPad Arduino. My research has shown that the tools we’re using to teach how circuitry works come with their gendered histories of who has designed and used them. In our schools as well as in out-of-school settings, our learners “read” this and respond in ways that meet gendered social conventions. For example, certain tools issue an invitation for members of the learning community to take a leading or, alternatively, a supporting role in the activity. Even though we don’t define a gender to inanimate objects in English, most people will likely see an electric drill as masculine and a sewing needle as feminine. People defend this interpretation because these tools remind them of professions where one gender is traditionally over-represented. But when these tacit expectations are ingrained into the tools we bring into the classroom, we’re inviting those same gendered cultural practices to play out from youths’ earliest learning experiences around STEM and maker education, setting the tone early for who is supposed to lead activities when boys and girls work in groups. Fortunately, new tools like LilyPad products are emerging every day in contemporary computing, spurring shifts in the ways we interact with technology. The LilyPad Arduino is perhaps one of the most salient examples that I’ve come across in recent years, spurring the emergence of what we can arguably call the first female-dominated computing industry. Instead of focusing on practices such as soldering and desoldering, the LilyPad Arduino allows designers to create e-textiles using sewing, quilting, crocheting, knitting and other techniques that have traditionally been the domain of seamstresses, knitters and crafters. 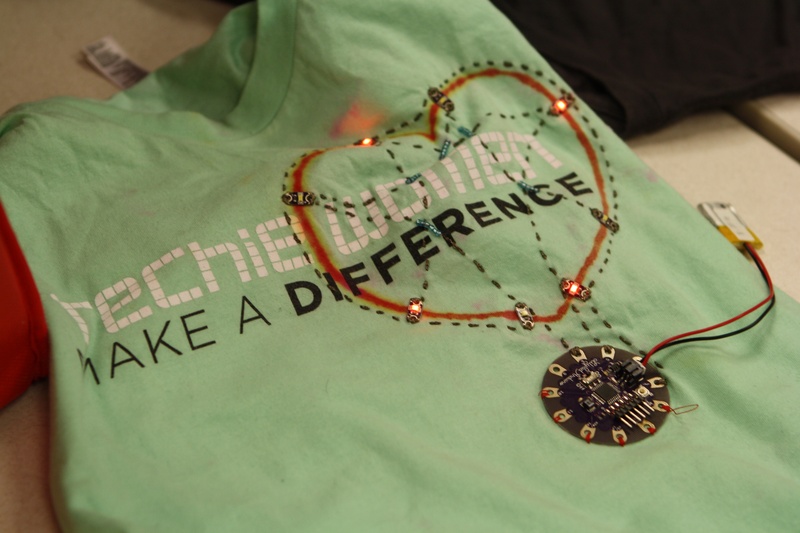 Exploring the use of e-textiles to teach circuitry to school-aged kids, I got to thinking: if we introduce cross-disciplinary technologies like these in our computing education, what impact would it have on girls’ participation in STEM? My research team set out to explore the possibilities. The capacity for e-textiles to shift participation was first documented by Leah Buechley and Benjamin Mako Hill, who discovered that while males created the majority of Arduino projects posted online (85 percent), women created most of the LilyPad Arduino projects (65 percent). What is striking about this comparison is that both types of projects share the same microprocessor and are programmed in the same language. To understand whether changing these factors could significantly alter classroom culture in a similar way, my research team has implemented a series of e-textile experiments in middle school settings, where we closely observe how gender dynamics play out. In contrast to what we see typically in classrooms where youths engage with new technologies, the girls were taking the leadership roles with the e-textile design work. This was true even when the boys had significantly more sewing experience than their female teammates. Long term, this type of hands-on experience leads to greater confidence as well as improved learning outcomes for girls. Changing our toolkits for STEM learning might already be a timely focus, given that many of the toolkits and associated activities we’re using in our classrooms fail to reap great results in the long term. Take circuitry, for instance, which is typically taught with a 9V battery, a small light bulb and wiring. To assess learning, students are tasked with diagramming a sample circuit and then indicating the direction of current flow. 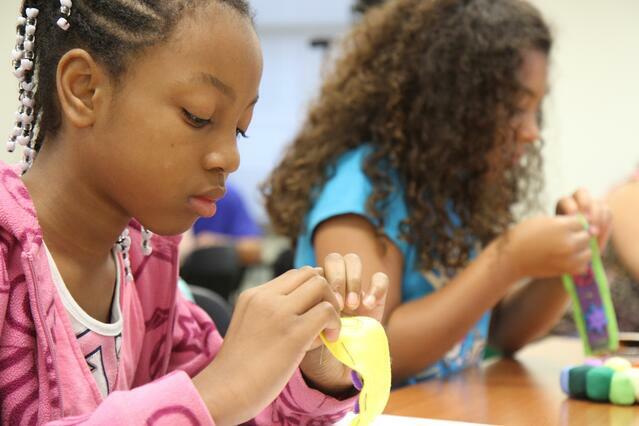 In our workshops, we created new assessments that incorporated sewable LEDs, battery holders and switches. Strikingly, students with prior experience constructing simple circuits could not translate their understanding to the new materials. However, after creating simple computational circuits with e-textiles, we found that students were significantly better able to diagram a working circuit, as well as demonstrate knowledge of current flow, circuit polarity and connectivity — concepts even college undergraduates in introductory physics and engineering courses have persistent misunderstandings about. Changing one’s tools in the classroom will do little to broaden computing education without the support of robust practices and products. For example, soldering a LilyPad Arduino into a small robot in place of a standard Arduino microcontroller (sometimes used due to its small size) is not as transformative as producing a novel form factor, such as a sewn circuit or piece of programmed jewelry. 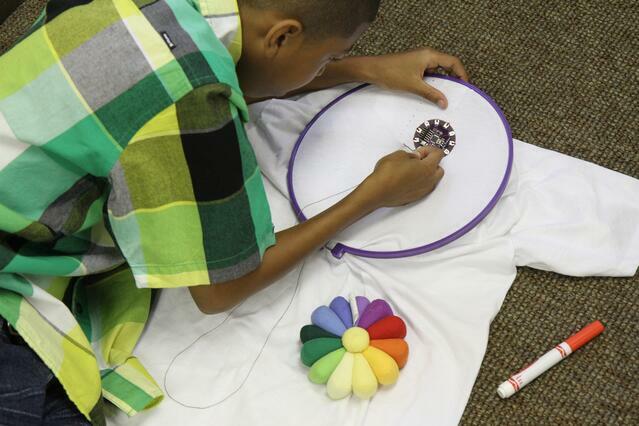 Engaging novice designers in sewing and other nonengineering practices is the key to cultivating interest in the activity and building a bridge between the arts and STEM. In trying to realize e-textile practices and products that will resonate with girls as well as boys in computing education, my colleagues and I have spent considerable time developing prototypes of such projects. Some have designed workshops around e-fashion and e-puppetry, while others have developed themes around sports, superhero costume design and theater to emphasize the work’s performance possibilities. The key take-home is that, rather than viewing gender as a static identity marker that defines participation in electronics and computing projects, educators should consider tools and materials that invite a broader array of historical practices into making. Taken together, emerging tools, materials, practices and products at the intersection of the arts and the STEM disciplines could revolutionize how we teach and learn as well as have rippling impacts within each of these fields. Kylie Peppler is an associate professor of learning sciences in the School of Education at Indiana University, Bloomington. An artist by training, she engages in research that focuses on the intersection of arts, media, new technologies and informal learning. She is coeditor of The Computer Clubhouse: Constructionism and Creativity in Youth Communities (Teachers College Press, 2009) and Textile Messages: Dispatches from the World of E-Textiles and Education (Peter Lang Publishing, 2013). Peppler earned a Ph.D. in education from the University of California, Los Angeles. Contact her at kpeppler@indiana.edu.